The first session of the Territorial Legislature met in 1854 in a two-story frame building, the Gold Bar Restaurant. The second session of 1854 met in the Olympia Masonic Hall, which served as the meeting place of the Legislature until 1856. In 1856 construction was started on a frame structure located on the present site of the Capitol Group, between the Legislative and Insurance buildings. That frame structure served as the Capitol for 46 years until 1902. With Statehood, Washington received a land grant of 132,000 acres to finance the construction of new capitol buildings. Ernest Flagg of New York was selected in an 1893 competition to build the new capitol. Excavation and foundation work was begun near the Territorial Capitol Building but was halted by an economic recession, the Panic of '93. Portions of those foundation were later incorporated into the construction of the present Legislative Building. In 1901 the State purchased the Thurston County Courthouse (now known as the Old Capitol Building). At the time Governor John Rogers stated that it would serve state government for the next 100 years. 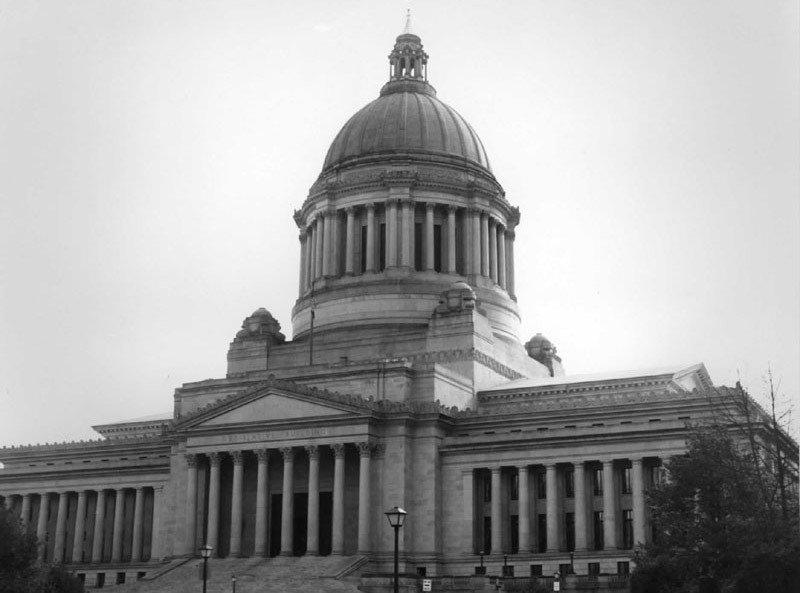 The building was enlarged and was ready for the Legislature in 1905 but the lawmakers soon realized that it would soon be too small to house Washington's growing state government. Another competition was held in 1911, which was won by two young New York architects, Walter R. Wilder and Harry K. White. They envisioned a capitol group instead of a single building. Work on the capitol buildings which would surround the centerpiece Legislative Building began in 1912, starting with the Temple of Justice. The project was completed in 1928. Weight of Dome: 30,800,000 lbs.